The relative dosimetry plays vital part in treatment planning of patients. Factors such as percent depth doses, tissue maximum ratios, tray factors, wedge factors, etc., determined from the relative dosimetry, affects the patient dose. 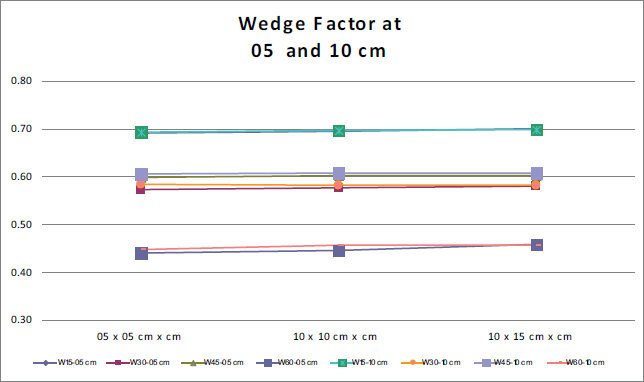 The current study intended at measuring and evaluating the wedge factor for different field sizes and depths for 60Co teletherapy unit GWXJ80 of NPIC China. The measurements for 15o, 30o, 45o and 60o wedges for different field sizes and depths on 60Co teletherapy unit GWXJ80 of NPIC China installed at Nuclear Institute of Medicine and Radiotherapy (NIMRA), Jamshoro, Pakistan, were done in water phantom of 30x30x30 cm3 dimension at 80 cm Source-to-Surface Distance (SSD) by using calibrated Farmer’s NE 2570 electrometer with NE 2571 0.6 cc ionization chamber. 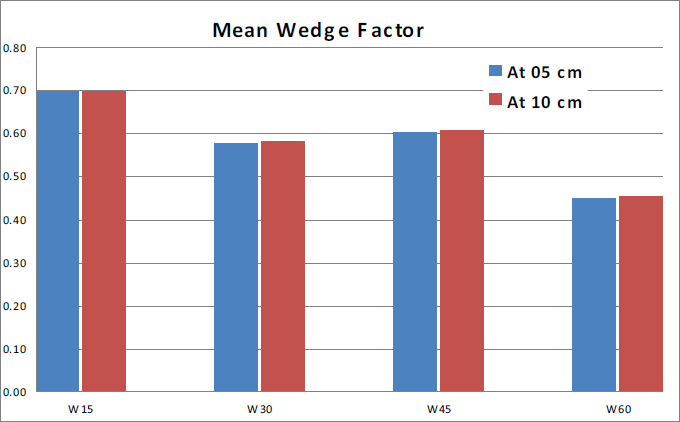 The evaluation of data showed that there was no significant difference in factor of each of wedge being analyzed for different field sizes and depths. The current study suggests that wedge factor for a particular wedge is approximately a constant value irrespective of field size and depth. The measurement for only one field size at one depth is sufficient to calculate the wedge factor for a particular wedge. 60Co, Quality assurance, Relative dosimetry, Field size, Depth. In radiotherapy, absolute dosimetry or simply dosimetry, is a systemic procedure for measuring the absorbed dose (also termed as calibration) in unit of Gy (Gray) of teletherapy machine directly under reference conditions (same field size at same depth with constant gantry and collimator angles and at a fixed SSD). All further measurements are then compared to this known dose under specific conditions termed as relative dosimetry . From these relative dosimetry variables, wedge filters are one of beam modifying devices and are being used to optimize the dose distribution in patients’ target tissues [2-5]. Due to the presence of wedge filter in the path of radiation beam, attenuation occurs in the beam intensity which can be expressed in the form of wedge factor (WF) at the central axis of the radiation beam [2, 4]. This attenuation is taken into consideration for calculating the patient dose and treatment time (TT) or monitor units (MU) [4-6]. Most of the times single WF is used for the patients’ TT or MUs, with usually measurements made for the reference field size of 10 × 10 cm2 at reference depth of dmax or d5 or d10 . Various researchers [2-32] have conducted studies on wedge factors for LA (Linear Accelerator), 60Co (cobalt-60) or for both type of treatment machines (LA, 60Co) as sumarized in Table 1. As seen from Table 1, several studies [2, 3, 6-23] have been conducted for LA only, whereas other studies [24-27] for both (LA and 60Co) and still other studies [4, 5, 28-32] for 60Co only. This study aimed at computing and comparig the differences in WFs of different wedges for different field sizes at different depths. 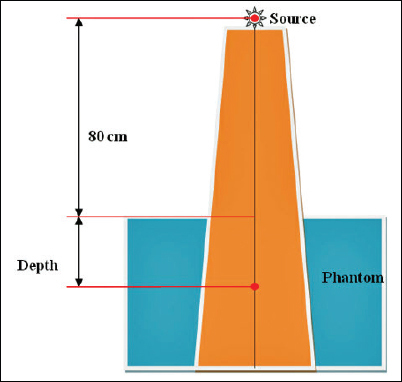 The WF of different wedge angles (15°, 30°, 45° and 60°) on different field sizes at depths of 05 and 10 cm were studied for GWXJ80 of NPIC China installed at Nuclear Institute of Medicine and Radiotherapy (NIMRA) Jamshoro Pakistan were done in water phantom with 30x30x30 cm3 dimension at 80 cm Source to Surface Distance (SSD) using calibrated NE 2570 Farmer Electrometer and 0.6 cc Farmer ionization chamber NE 2571. All of the measurements were performed at 0° gantry and collimeter angles [33, 34]. The setups for non-wedged and wedged beams are shown in Figures 1 and 2. The measurement for specific wedge is to be one at same set of parameters (like for same field size at same depth, for the same dose or time of exposure with constant gantry and collimator angles and at fixed SSD [2, 27, 33, 34]. The WF for different field sizes at different depths (05 and 10 cm) along with their means and standard deviations (SD) for 60Co teletherapy unit GWXJ80 of NPIC China installed at Nuclear Institute of Medicine and Radiotherapy (NIMRA) Jamshoro Pakistan have been congregated into in Tables 2 and 3 whereas their graphical representation have been shown in figures 3 to 6. The results from other researchers on wedge factors for LA, 60Co or for both type of treatment machines (LA, 60Co) along with current study on 60Co teletherapy machines [2-9, 11,13, 14, 16-19, 22,23,25, 27-32] has been summarized in Table 4. As seen in the table 4, studies [2, 3, 6-9, 11, 13, 14, 16-19, 22] shows WF for LA only, whereas studies [23, 25, 27] shows factor for both (LA and 60Co) and studies [4, 5, 28-32] for 60Co only. For LA, the WF differed is between 1% to 25%, whereas for both (LA and 60Co) and for 60Co only including current study, the difference in WFs is between 2%-9% and 0.5%-5.5% respectively. The current study is comparable and judged to other studies done for WF for 60Co only or with all other data available for LA, or for both (LA and 60Co). Most of the available data (specially for 60Co only) did not show any significant influence on the Wedge factor [2, 16]. Small negligible variations within about ±2.5% for most of WF have been observed which can affect little bit on dose of the patient. The overall error in dose delivery to patients should not go beyond to ±5%  on recommendations of reports of International Commission on Radiation Units and Measurements (ICRU) [35, 36] and the Nordic Association Of Clinical Physicists (NACO) . The current study presents a comparison of WF for Wedges supplied with the teletherapy unit. 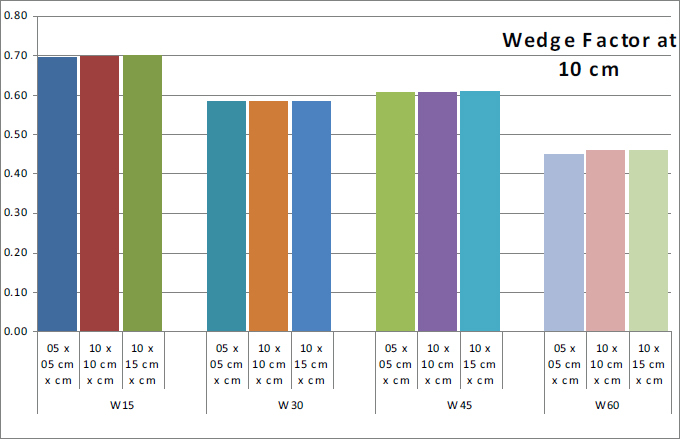 The data evaluation showed that non significant difference in WF of each of wedge being analyzed for different field sizes at different depths. This study suggested that WF for a specific wedge is approximately a constant ratio irrespective of field size and depth. 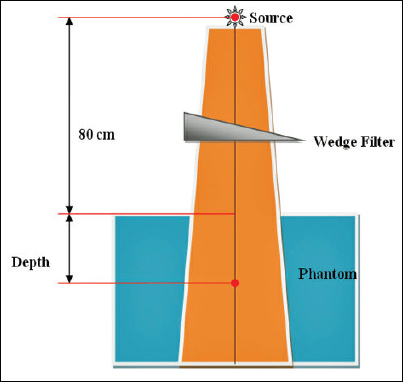 The measurement for only one field size at one depth is adequate to calculate the WF for a specific wedge. Ethical committee of NIMRA approved the current study. As there is no any data of patients/subjects has been used in study, only the teletherapy machine and dosimetry system is used, so no need of consent is required. Interntional Atomic Energy Association (IAEA). Available via https://rpop.iaea.org/RPOP/RPoP/Content/Docum ents/.../RT02_Phys2_Equip_WEB.ppt Accessed on 1st October 2016. Saffar MH, Ghavamnasiri MR, Gholamhosseinian H. Assessment of variation of wedge factor with depth, field size and SSD for Neptun 10PC Linac in Mashhad Imam Reza Hospital. Iran J Radiat Res 2004; 2(2):53–8. Ahmad M, Hussain A, Muhammad W, Rizvi SQA, Matiullah. Studying wedge factors and beam profiles for physical and enhanced dynamic wedges. J Med Phys 2010; 35(1):33–41; https://doi:10.4103/0971-6203.57116. Haq MM, Rehman M, Ahmad A, Khan NA, Ayub M, Ahmad S. Installation, commissioning and quality assurance tests of first Indian made tele-therapy Cobalt machine (Bhabhatron- II) at Sher-I-Kashmir Institute Of Medical Sciences, Srinagar, Jammu And Kashmir. JK- Prac 2014; 19(3–4):93–9. Safar MH, Ghavamnasiri MR, Gholamhosseinian H. Study of wedge factor dependence with depth, field size and SSD in 60Co units. Iran J Bas Med Sci Spring 2005; 8(1):4–8. Podgorsak MB, Kubsand SS, Paliwal BR. Dosimetry of large wedged highenergy photon beams. Med Phys 1993; 20:369–73. Popple RA, Brezovich IA, Duan J, Shen S, Pareek PN, Ye SJ. Determination of field size dependent wedge factors from a few selected measurements. J App Clin Med Phys Winter 2005; 6(1):51. Wu A, Zwicher RD, Krasin F, Sternick ES. Dosimetry characteristics of large wedges for 4 and 6 MV X-rays. Med Phys 1984; 11:186–8. Van Santvoort J. Dosimtric evaluation of the Siemens virtual wedge. Phy Med Biol 1998; 43:2651–63. Dean EM and Davis JB. The variation of wedge factors with field size on a linear accelerator with wedge tray beneath secondary collimator. Br J Radiol 1991; 64:184–5; doi:10.1259/0007- 1285-64-758-184. Choi R, Ahn YC, Huh SJ. Clinical application of wedge factor. Radiat Oncolo J 1995; 13(3):291– 6. Andrabi WH, Koul SK, Kharadi MY, Abbas SM, Bhutt MA, Sofi AG, Ashraf M, Maqbool M, Afroz F, Ahmad B. Installation, commissioning and quality assurance of cobalt unit (Theratron 780E) at SKIMS, Soura, Srinagar. JK- Pract 2004; 11(2):144–8. Memon SA, Cheema AA, Laghari NA, Mangi FH. Dose measurement of Cobalt-60 radiotherapy beams in treatment fields. J Ayub Med Coll Abbottabad 2014; 26(3):279–82. Memon SA, Laghari NA, Mangi FH, Ahmad F, Hussain MM, Palijo S, Jhatyal N , et al. 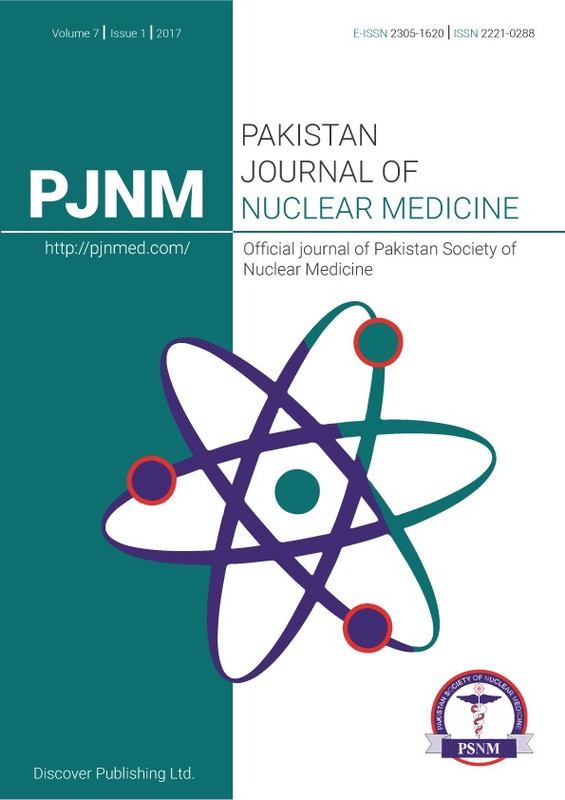 Analysis and verification of percent depth dose and tissue maximum ratio for 60Co gamma ray beam, World Appl Sci J 2015; 33(1):109–13; doi:10.5829/idosi.wasj.2015.33.01.9261. International Commission on Radiation Units and Measurements. Determination of absorbed dose in a patient irradiated by beams of X or gamma-ray radiotherapy procedures. ICRU Report No. 24. ICRU: Bethesda, USA; 1976.
International Commission on Radiation Units and Measurements. Prescribing, recording and reporting photon beam therapy. Report 50, ICRU: Bethesda, USA; 1993. Nordic Association of Clinical Physicist. Specification of dose delivery in radiation therapy. NACP: Sweden Stockholm; 1994.